Make dinner reservations at Les Papilles. Check out any of these expos. Go for coffee on the Printemps terrace. Enjoy a three-course lunch at: Mirroir, Joli Deli, Café Constant, Verjus, and/or Crêperie des Pêcheurs. Invest in souvenirs at Merci. Take a sweet break at La Maison du Chou. Stop by the La Maison Européene de la Photographie. 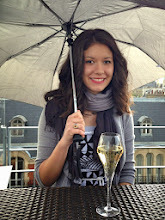 Have an aperitif at le Ciel de Paris. Save money on dinner at: Gyoza, Chez Glandines, Un Zebra a Montmartre, and/or Chez Omar. If you like jazz, New Morning is a must. Escape Paris for the day to Chantilly, Saint-Germain-en-Laye, Gentilly, Maisons-Lafitte, Fontainbleau. Season-specific: Go to the beach. See a movie en plein air. Picnic along Canal Saint-Martin, in the Jardin du Luxemborg, by the Seine, at Parc de Buttes Chaumont, etc. In my opinion, visiting Paris the second, third, fourth time around can be infinitely more magical than the first. Though I added a few points to my original list (in response to a request from that friend I just met up with as she passed through), the fact remains: classic sights are still there for the taking, but now you have opportunity (and, dare I say, obligation) to get a taste of the real thing. Photo from the Bastille Day picnic. This makes me feel even more eager to get there and leave again and come back, again and again! Governy makes another good day-trip from Paris, whereas Parc Montsouris is my go-to spot for picnic. Also, keep an eye out for small streets or courtyard access from the street, then venture in. It'll often take you places that you simply don't expect to find! No worries! That's why I put this together :) glad I have another Les Papilles supporter. I must try Parc Montsouris for my next picnic. Just popped over from Sara in Le Petit Village. I've visited Paris many times and we were there last month but I'm always on the look-out for new places to visit. La Maison du Chou will be top of my list. We loved the choux at Popelini. Welcome! I hope you get a chance to go when you're here next, it's adorable. Aw... sorry for the delay! It does mean you have to come back though :) glad you like and looking forward to having you follow!